Congratulations to our April Athlete of the Month, Augusta Binns-Berkey! How we choose our Athlete of the Month at Hierarchy isn’t necessarily the person with the fastest times, highest strength numbers, or most PR’s. An Athlete of the Month is someone who carries a positive attitude with them each time they walk through the door. They show up early, give everything they’ve got in each workout and has a constant pursuit of being a better human. At Hierarchy, we pride ourselves on having an outstanding, close-knit community, and our Athletes of the Month represents the qualities that make our community so great. We are pleased to announce our April Athlete of the Month - Augusta Binns-Berkey. One who never quits, gives it her all during every workout, and does it with a smile - Augusta is what CrossFit is all about. Augusta is one of those athletes that might fly under the radar a bit, but don’t let her fool you. She works extremely hard, very consistent and has been improving in all things CrossFit since the day she walked in the door. Augusta knows her body and her limits well but still pushes and challenges herself to learn new skills and become a better athlete. One of many notable performances that stand out was her 19.2 performance - She improved her score the second time around by a full round AND PR'd her Squat Clean for multiple reps. Please help us celebrate our April Athlete of the Month, Augusta! I went to the free intro class last summer, thought about it for a lot of months, and then joined for real in November. I grew up in Connecticut, and my close family is still in the northeast, but my extended family is spread out all over the country. I moved to DC in 2013 for grad school and don't plan on leaving any time soon. I'm a big Patriots and Penguins fan (don't ask how that happened) but I'll root for the home team in DC, unless it's the Capitals. Most recently, nothing. I used to do yoga and run a fair amount, including a handful of half marathons and 10-mile races, but stopped a few years ago. I've always been pretty hopeless at team sports but love the team aspect. I had never really lifted weights before Crossfit. I had a few friends in grad school who started at H1 (hi Eva and Terry!) who loved it and convinced me that the coaching would help me get over my fear of injury. When I moved to Northeast last year, H2 suddenly became really convenient and I decided to give it a try. That was a lot of squats! But I did all of them! That's my memory of the first foundations class. Amber reminded me recently that my first actual workout in November involved thrusters, but I think I blocked that out. I didn't have specific goals except getting back in shape and getting comfortable with the new movements. It was more just about finding a fitness routine that I liked enough that I could make the commitment to regular exercise again. Yes! It's been easy to make the gym part of my regular routine, enough that I'm frustrated if I can't go. 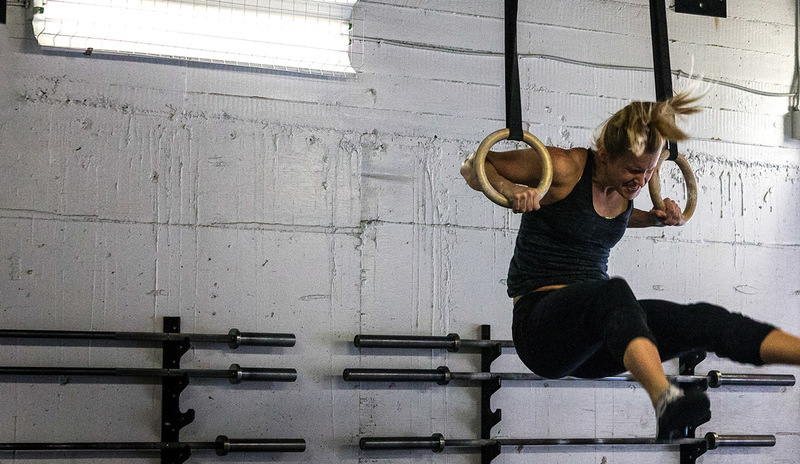 Comfort with Olympic lifting and gymnastics movements will always be a work in progress. Now I set lots and lots of smaller goals, whether it's new PRs on certain lifts or mastering specific skills. I recently got over my fear of dying doing box jumps. Next up will be double-unders. Someday I'd like to do a strict pull-up. Yes! I've definitely seen an improvement in my overall health (sleep, energy levels, stress levels, etc). I've tried pretty hard to not turn into that person who talks about Crossfit all the time. You can ask my friends and coworkers how that's going. 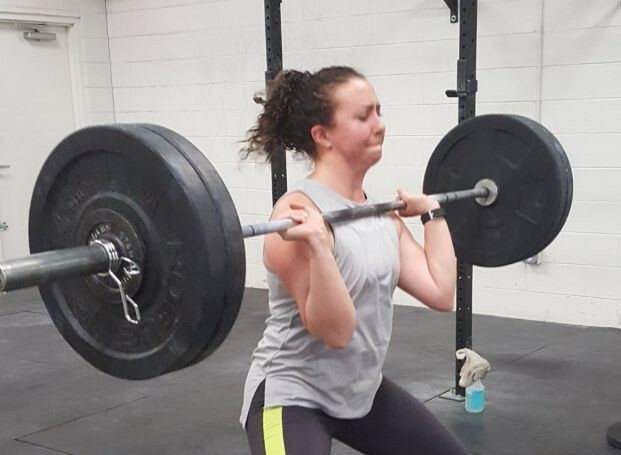 My biggest fear when joining was really intimidation -- there are so many people at Crossfit Hierarchy who can lift such heavy weights and do amazing things on the rig or upside down, and I was worried I was going to be the slow one, or the one scaling every movement. Turns out, I was -- and it didn't matter. Everyone was so welcoming and so friendly, including all the coaching staff but also so many of the other athletes. I got over my fear of looking stupid pretty quickly. Now, the gym is an hour when I don't think about anything else except finishing the workout and doing it well. The best feeling I've had at the gym was from the Open. I didn't sign up officially but had decided to do all the workouts with everyone and was frustrated with 19.2. I came back a couple days later and redid it, and got through an entire additional round. I realized afterward that it had technically been a squat clean PR. I thought at the time that I'd like to bottle up the feeling of satisfaction and keep it for the future when I'm not making progress so quickly. Don't be scared! You definitely don't have to already be super fit to start. Just scale where you need to and put in the work, and you'll be amazed how quickly you'll make progress. Workouts with running instead of rowing (I'm still emotionally scarred on the rowing machine from high school crew). I've grown to kind of like burpees and box jumps. Also partner workouts, because I'm always really motivated. I still sometimes get frustrated by gymnastics workouts that I have to scale a lot (toes to bar comes to mind). Snatches, overhead squats ... I haven't gotten over my fear of overhead work yet. I played on the JV hockey team for one season in high school, and at the end of the season I was given the "I get knocked down, but I get up again" award.